Burke & Hare Co is the perfect shop for those that crave something different and for those into the peculiar. I first found out about Burke & Hare Co earlier this summer and I was instantly a fan. Erica makes gorgeous pillar candles, body butters, wax melts, and has an amazing line of themed scented candles. From her etsy bio, she states that Burke & Hare Co is "heavily influenced by a penchant for the dark and dreary along with music of the sort, we strive to find beauty in superstitions, natural magic and the history of the occult." 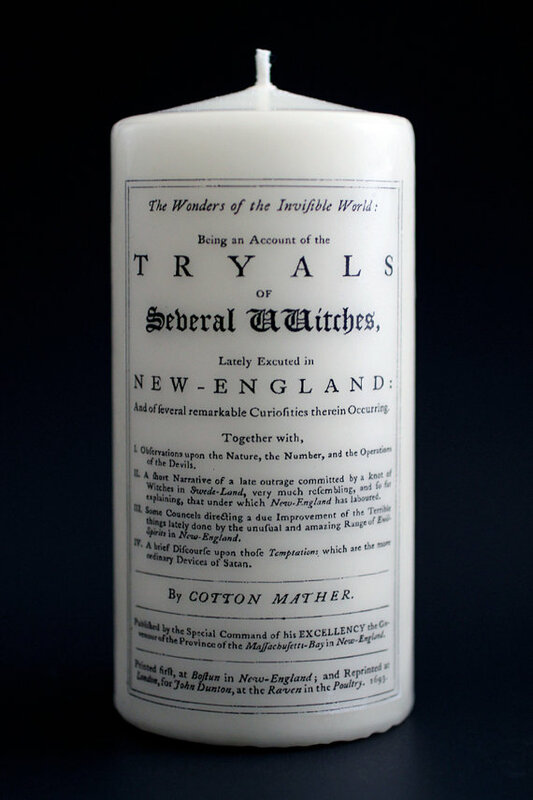 My first candle from Burke & Hare Co was the full size Salem candle, a sample of Altar, and a travel of Santalum. I immediately fell in love with Salem. I've never loved the scent of a candle more. It was dark and mysterious. I'd never smelled anything like it. I used every last bit of these three candles and recently made another order. I picked up a second full size Salem candle and a sample of Cloves. I was delighted to see that Erica also included a sample of Lunacy and a tea light sample of Nevermore. I find it rather difficult to order candles online because you never quite know what they are going to smell like--which is why I think it's brilliant that Bure & Hare Co offers sample candles--- you can try a scent or three for a low price and if you love it, go back for more. I have not been disappointed by any of these scents so far. Every single one is so unique and with beautiful notes. I'll go into detail of the notes for candles I have in a moment. Before I get into the notes of the candles I own, I wanted to share some of the pillar candles that Erica sells on her site/Etsy. 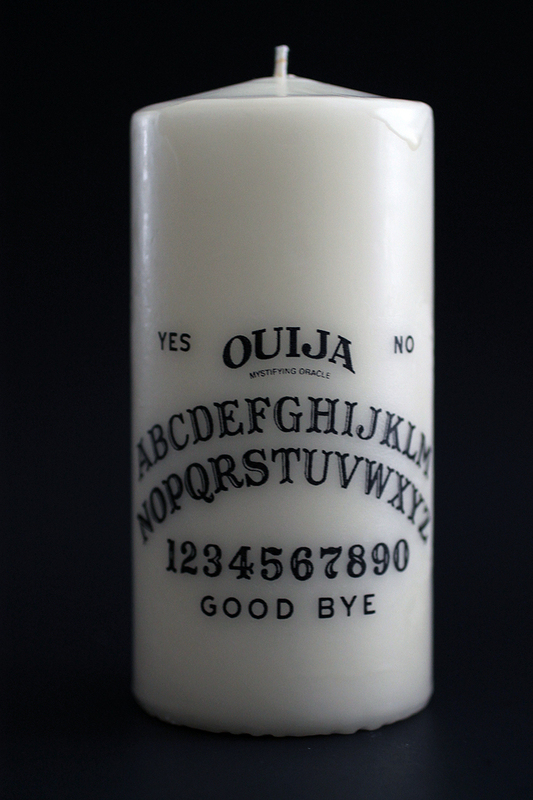 The pillar candles are unscented and run about 5.5-6 in tall and features things like Ouija board art, an article of witches, tarot, nature, and taxidermy. The are fully functional candles, but I'd honestly just want to use them as decoration. Pictured below are a few from her Etsy. Salem, part of the Darkwave collection, has deep notes of patchouli dusted with balsamic resin with hits of black teas and jasmine florals. Deep and mysterious, black as midnight. It's seductive. Altar, part of the Darkwave collection, is fragranced with the deep scent of blackened roses over dark red wines with a base note of must to warm the scent and notes of spicy wood to add to the complexity. It's floral, but not overwhelming. It's a sensual fragrance. Cloves, part of the Darkwave collection, is dark and sultry with the scent of spicy cloves with a peppery undertone and a hint of darkened mandarin. This is a beautiful fragrance and one I would burn more in the fall/winter months. It makes a gorgeous holiday candle. Lunacy, part of the First collection, blends the calming fragrance of lavender and pure vanilla extract over hints of earthy patchouli. It's a soft and tranquil scent. The perfect candle for a relaxed atmosphere. Nevermore, part of the First collection, is masculine and a bit seductive. Leather and tobacco intermingle with black tea and notes of spicy pepper and a subtle undertone of teakwood. I highly recommend this shop and I'm certain you'll love any scent you try. I can't wait to try more scents when I finish burning those that I have. If you would like to check out Burke & Hare Co's products, you can find them on Etsy or Instagram. ***To maintain transparency, I want to let you know that this blog post is not sponsored. My opinions are my own and are truthful. I purchased these products with my own money and support this shop. If I happen to get a coupon code for you, I'll be sure to post it here!